“The geometry of this card is the place at which female and male energies join to create something entirely new. 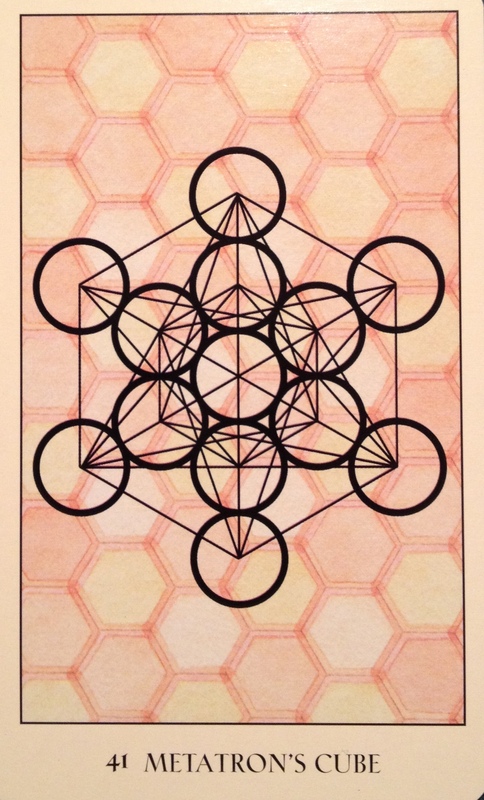 By beginning with the thirteen “female” circles from the Fruit of Life and connecting every center with straight “male” lines, a shape known as Metatron’s cube appears. View this image as a three dimensional configuration. Within the shape, concentrate on the line and see if you can find each of the five Platonic solids, or cosmic volumes, as we like to call them. You can see, then, how the joining of male and female energies creates substance and form. If you choose this card you are asked to see how substance and form are working in your life and to view them as aspects of male and female cooperation. Allow this card to represent a time of balancing the Yin and Yang or your inner life to promote harmony and creativity. This may be your own male and female aspects seen as offering creative solutions to challenges or projects. You will more easily connect with the substance of your inquiry. What form does the outcome take? Metatron’s cube is a metaphor for all problem solving, not only in third dimensional realty but in other dimensions as well. This card may also represent the relationship you have with others and how by joining through substantive action your form community. Community brings together disparate aspects of humanity, and when held in balance, it creates a cohesive whole. Do you feel part of a community? Are the contributions you are making giving life and form, peace and substance, justice and freedom to the community as a whole? We each hold a delicate balance of masculine and feminine energies. The feminine dreams and creates and the masculine takes action and moves forward. Sometimes we can get out of sync, or unbalanced as we delve more deeply into one or the other, rather than holding them equally. If you find yourself dreaming and starting projects but not following through and finishing by taking the action, you may be unbalanced in your feminine energies; lacking the necessary motivation to continue through to manifestation and fruition. If you are constantly pushing forward, unreceptive to new ways of doing things while stepping on toes and competing with others, you may be overbalanced in your male energy. Bringing these sacred energies back into balance will not only assist you in creating what you wish to create, and bring it to harvest; it will also balance the relationships that you must nurture in order to do so. We are rarely alone in our lives, and our actions and creations affect others. When we can balance our feminine, we can create with love and care, when we incorporate the masculine, we can take the action required to complete the manifestation of the creation. Action fueled by love and acceptance in a perfect cycle of harmony. We can do this by remaining mindful and focused throughout the process, intending to connect with both our Divine Feminine and Divine Masculine energies.